The ProtectYou2TM Safety Enhancement System Cover is ideal for those concerned about bed safety or for use in rail-free facilities. The coluntary ingress/egress sections address restraint concerns. 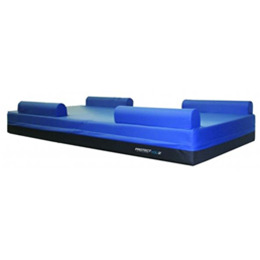 Built-in bolsters serve as a gentle reminder to the patient that they are nearing the edge of the bed. Ingress/egress section allow for easy entry and exit. The fluid resistant, anti-microbial,, breathable stretch material is easy to clean, wipe down or machine wash. Meets CAL 117 and CFR 16 Part 1632 flame-resistant standards. BPA-free and is flame resistant.